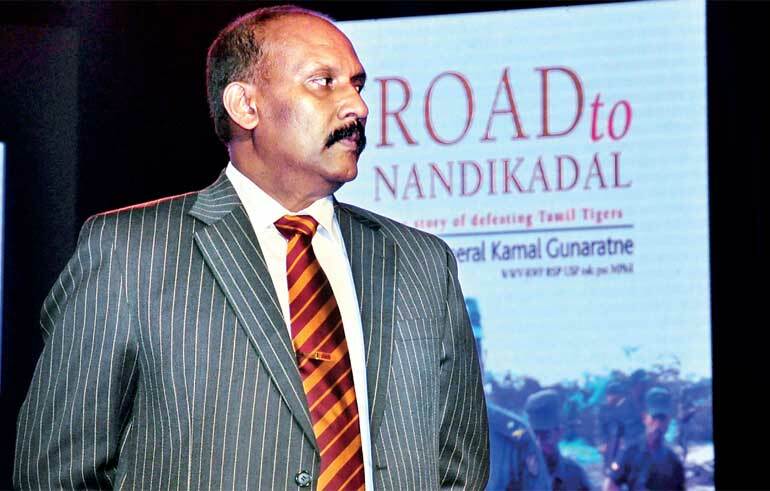 Major General Kamal Gunaratne who commanded the 53rd Division of Sri Lanka Army to defeat and kill Velupillai Prabhakaran, the Leader of the LTTE, has written his memoir, ‘Road to Nandikadal’. Hats off to Gunaratne and his fellow commanders and troops for achieving this target of defeating the LTTE which was unthinkable some time back. Political leadership provided by Mahinda Rajapaksa, administrative support of Gotabaya Rajapaksa, military strategies of Sarath Fonseka and the other commanders contributed to this achievement. Gunaratne has given an interview to Daily FT which was published on 6 September. He commented as follows. Q: You are now retired from the SLA after spending your entire youth fighting the LTTE to bring peace to the country. What do you have to say now? A: Yes, I hung up my uniform which I wore for more than three decades and I went home on 5 September as a proud soldier of the victorious Sri Lanka Army. I never wanted to retire as a defeated soldier, so I have made my dream a reality. I will be having a simple life with my family. Not only me but all my colleagues, who commanded the war, have sacrificed their entire youth in jungles fighting the LTTE. With lots of dedication, commitment and sacrifices, we achieved peace. I think it is the responsibility of the political leadership of this country to maintain an everlasting peace. We talk about reconciliation but listen to those who ask for land powers, devolution of powers, police and judicial powers and demand the removal of the Director of the Kilinochchi Hospital as he is a Sinhalese and to appoint a Tamil official. Just because we sang the National Anthem in Tamil, reconciliation doesn’t take place. The Government should be alarmed by the latest developments, which disturb peace, taking place in the north. The political leadership needs to take them as eye-openers and look at from a wider angle. Q: Do you mean to say that the LTTE could stage a comeback? A: If the situations are not handled properly, the LTTE can make a comeback as over 12,400 ex-combatants are living in society. Though they have undergone a comprehensive rehabilitation program, that doesn’t mean that they are 100% transformed into civilians. The new leadership will not be effective as Prabhakaran’s leadership but if a situation is created, the LTTE will make a comeback because the LTTE ideology is still alive. I don’t think that the Tamil political leaders will be satisfied with judicial, land and police powers as the agenda of the Tamil National Alliance is Eelam and nothing else. Gunaratne emphasises the point that we should maintain an everlasting peace and at the same time he said that the Government should be alarmed by the latest developments. On one hand it seemed to be that he did not endorse devolution of power including land and police powers and on the other hand he was of the view that the leaders of TNA would not be satisfied anything less than Tamil Eelam. His method of maintaining peace seems to be continuing suppression of the Tamil people. Not to devolve any power assuming that somehow the Tamil leadership would achieve Eelam is placing the country in war footing forever and it is clear undermining of the efforts of the Government and R. Sampanthan in the path of reconciliation. Generals should fight wars for which they are capable of and they are not capable of civilian management unless they shed that war mentality. Throughout the last regime war-mentality was prevailing in all the affairs of the Government including relations with UN and Western nations. Mentality of a diplomat was alien to them. Diplomats take firm stands very often but they are capable of handling the situations. Denzil Kobbekaduwa, one of the greatest military leaders we ever had, was of the view that although the armed forces could defeat the LTTE, there should be a political solution for the ethnic conflict of the country. Kobbekaduwa did not want to apply his war mentality in civilian affairs and he was able to distinguish the two. Soon after the end of the war Sarath Fonseka the General who spearheaded the war victory asked for more troops to be stationed in the north to safeguard the captured territory where Rajapaksa the President did not agree quite correctly. Contrary to the stance of a General, Dutugemunu adapted an unorthodox method in a similar situation two millennia back. When marching towards the enemy positions he had taken bhikkus to the battlefield and stationed them in geographical areas captured from the enemy. The act of keeping bhikkus rather than soldiers in those captured areas positively influenced the mentality of the people who lived in those areas and also supported the requirement of the military commanders to have more soldiers at the battle front. Dutugemunu being a crafty statesman knew where to apply the war mentality and where to apply the mentality of a Statesman. Subsequent to the political pressure to demarcate the states based on the languages used, in 1953 16 provinces using Telugu language in Madras Presidency were clustered and a new state called Andra state was created. The States Reorganization Act was enacted on 31 August 1956 and based on that all the states in India were re-demarcated in line of the languages used. Following were the changes experienced by South India. Hyderabad state and Andra state were combined and Telugu speaking Andra Pradesh was created. Travancore-Cochin state and Malabar provinces of Madras Presidency were combined and Malayalam speaking Kerala state was created. Tamil speaking Southern provinces were amalgamated with Madras Presidency which was renamed as Tamil Nadu in 1968. Kannada speaking provinces of Hyderabad state and western Bombay state were combined with Mysore state which was renamed as Karnataka in 1973. Recently a portion of Andra Pradesh was demarcated to create Telangana State. The Indian Tamil separatist movement was dried away with demarcation of the states based on ethnicity. This move was taken by the Indian Prime Minister Jawaharlal Nehru with the blessing of the Tamil political leadership. Sri Lankan Northern Tamils also would behave in the same manner. Thought leaders of communalism should understand the basic requirements of the people and their behaviour patterns before rushing in to judgments. Prabhakaran was not satisfied until he get Eelam and it was amply evident when he replaced Balasingham with Thamil Chelvam at the peace negotiations during the time of Wickremesinghe Government when Balasingham agreed to internal self-determination. However placing Sampanthan also at the level of Prabhakaran or placing TNA leadership at the level of LTTE leadership is gross miscalculation of the ground scenario. In order to prevent an LTTE comeback which is the goal of General Gunaratne as well, the Government in the first place should have treated the Tamil civilians in the same manner the Government treated the Sinhala civilians soon after the suppression of the second JVP insurrection. The Government understood the displeasure of the Sinhala civilians and towards the armed forces and the forces were withdrawn from those areas. During the election time present Government has pledged to release the Tamil detainees who were kept without filing cases if there were no charges and if there were charges to file cases against them. Also it was pledged to release land of the Tamils acquired by the Army for security reasons since the security concerns are not in existence now compared to the war time. Fulfilment of both these pledges is very slow, causing discontentment among the Northern Tamils and strengthening the stance of the Tamil hardliners. One of the major factors of this slow phase is due to the pressure of the armed forces who are obsessed with this war mentality which is a hindrance for the forward march of the nation. We cannot have a nation eternally divided as Jews and Palestines. Even in Israel there were military leaders who subsequently engaged in peace process shedding their war mentality since there is no way out other than the peace. During the six day war between Israel and the Arabs in 1967 Moshe Dayan was the Israel Minister of Defence who was the former Commander of Israel Defence Forces (IDF) and Yitzhak Rabin was the commander of IDF. During the war Israel acquired large territories from Egypt, Jordan and Syria and both Moshe Dayan and Yitzhak Rabin were considered war heroes. Moshe Dayan later became the Minister of Foreign Affairs and contributed to the Camp David agreement between Israel and Egypt. Yitzhak Rabin became the 5th Prime Minister of Israel in 1974 and spearheaded the peace process with Egypt and Palestine Liberation Organization. He was awarded the Nobel Peace Prize for his work. Later he was assassinated by those who were against the peace process. Lee Kuan Yew, former Prime Minister of Singapore, once said Sri Lanka was a nation which was not able to manage the ethnic conflict. We have opened the economy well before India did. If there was no ethnic conflict GDP of Sri Lanka by now would have been in line with that of the East Asian countries. It is the time to shed petty conceptions and take productive steps to bring economic prosperity to the country. It is the best service we can do for our children and future generations of this country.